This mens Dreyfuss 1924 watch has PVD gold plating and a silver dial with Roman numeral markers and a date function. The watch is waterproof and fastens with a hidden clasp. When I received watch I was surprised at the luxury box and paper info. and brochure relating to the watch. The face is beautiful, with delicate and classy details on numbers, brand name and hands, also dial has delicate, intricate work. 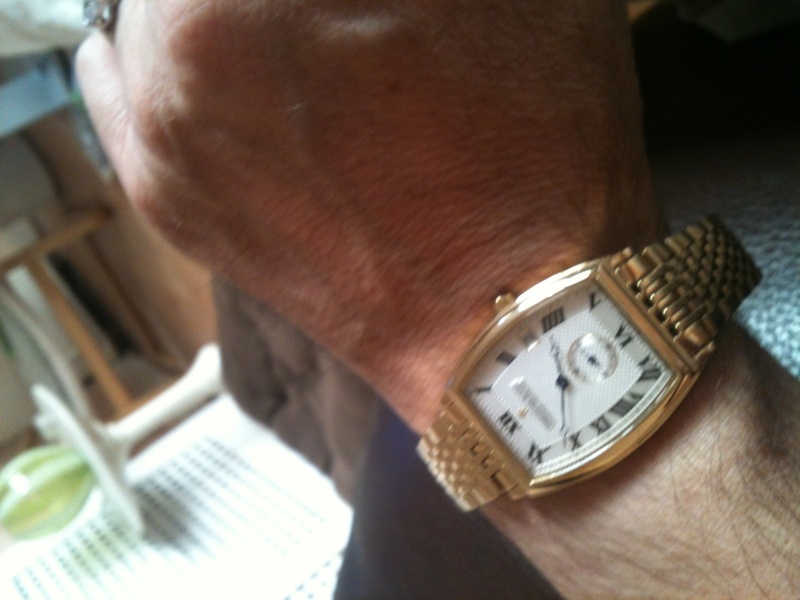 It looks like a more expensive watch, ie Cartier. Very pleased with purchase. Great service, amazing product, bought for my fathers 45th wedding anniversary present, just the job. Will definitely use this site again. I have collected various Swiss watches for years and discovered Dreyfuss and Co. Five years ago. The latest one I ordered is a mens rectangular shaped, silver face with gold bracelet. This is the fifth Dreyfuss watch I have purchased and have been more than pleased with them all. All Dreyfuss watches are supplied in the most luxurious wooden box I have ever seen and to my delight the latest one has space for all five of my watches. Previously I have bought them from high street jewellers at twice the price but never again. Keep up your good service and sensible prices. This is a handsome mans watch which I bought for myself, a woman. The gold bracelet and watch face punch way above their weight. The only drawback is the bracelet clasp. It extends well beyond the width of the bracelet and I find that it digs into the wrist, which can be uncomfortable. Dreyfuss Co watches have an illustrious heritage that encompasses more than a century of Swiss watch-making precision for the discerning customer. Created by the leading horologist RenÃ© Dreyfuss, the brand has a long history of exquisite craftsmanship, passionate design and quality materials as the foundation for this collection of Dreyfuss Co watches. Both ladies' and gents' Dreyfuss Co quartz watches embody the spirit of the long-established brand; that combination of quality and style that Switzerland is renowned for. A Dreyfuss Co watch comes with a guarantee of quality and a legacy of fine timekeeping tradition that dates back to 1890. Each hand-crafted timepiece is inspired by the original ideas of the company founder, immortalised as the brand ethos in 2005: precision, passion and the ability to see the world differently. Watch Shop is an authorised Dreyfuss Co stockist. Sign up to receive email updates when new styles of Dreyfuss Co are added to Watch Shop!